All of the Walt Disney World resort food courts offer special refillable insulated mugs. These can be purchased for a one-off fee and can then be refilled at the resort’s drinks fountain station as often as you like for the duration of your stay. However please note that you cannot take them back again for further free refills during subsequent stays. The mugs used to be well-themed and would vary from resort to resort, but more recently all of the Walt Disney World resorts have offered just one standardised generic design which is changed roughly once a year. The current mugs have a Fab Five character theme, and the handles/lids are available in red, green, purple or blue. Walt Disney World’s new refillable mug program — “Rapid Fill” — is being rolled out at all Disney Resort hotel locations which have self-service beverage stations. The drinks stations at the Port Orleans food courts were switched over to the new system on 19 August 2013, having already been pre-selling the new style of mug for about a week. The new Rapid Fill mugs feature a radio frequency identification (RFID) chip installed in the base of the mug which allows it to be used for a specified amount of days only, all the way through to the guests’ entire length of stay (multiple-resort stays are permitted, but the days must be consecutive and would need to be set up for you by a Cast Member). The mugs were originally priced using a tiered structure starting at $8.99 for 1 day, $11.99 for 2 days, $14.99 for 3 days, and $17.99 for a full length of stay. However now they are only sold at a single price — currently $18.99 — which covers 14 days, or up to the length of your current stay. The mugs can be used as often as you like during the chosen time period (which ends at midnight of the final day of use) but there is a mandatory 2½ minute delay between refills. Mixed drinks can be dispensed (subject to the overall maximum fill-level for the cup) by partially filling your mug from several different dispensers in succession — but there is a 70 second time limit for doing this. It will still be possible to buy a single drink at the food courts, and the paper cups will also contain an RFID chip coded for several refills over the next couple of hours. Coffee, hot chocolate, iced tea and water/ice are NOT restricted by the chips. One new feature is that the mugs will now allow guests to refill beverages at any of Disney’s Resort self-service beverage stations, not only at their home Resort — but NOT at the pool bars, theme parks, water parks or Disney Springs. 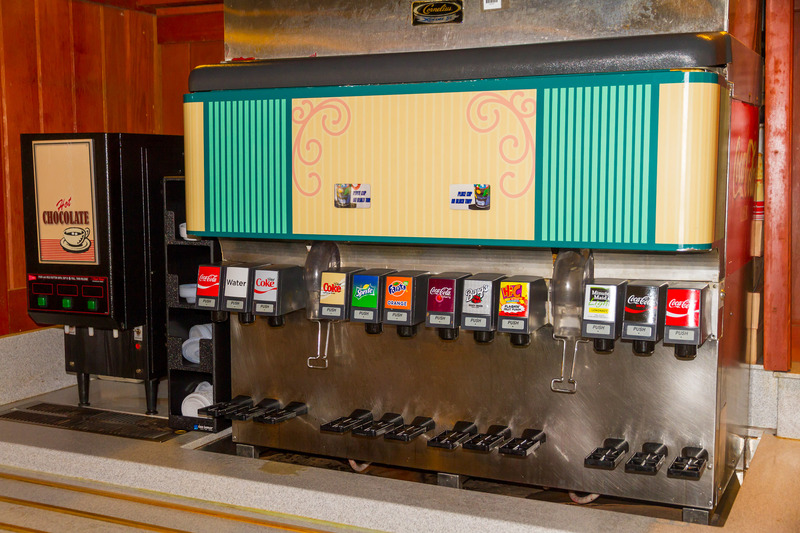 Guests will be able to check their remaining days via the fountain beverage dispenser’s display screen while they refill. Rapid Fill mugs may be purchased and activated at the Riverside Mill or the Sassagoula Floatworks & Food Factory. 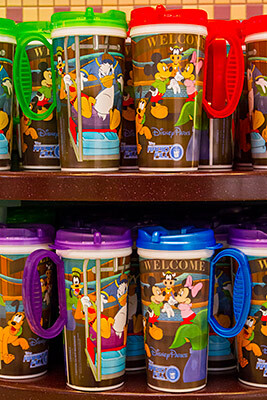 All Disney Dining Plan guests receive a free Rapid Fill mug as part of their package, and at busier times these can be picked up at the main Reception Lobby when you check in which avoids you having to queue in the food court before getting your first drink. Note: Before around 2000, the resort mugs were sold on a “perpetually refillable” basis, so if you still happen to have an older design — even dating back to the old Port Orleans/Dixie Landings days — then technically you should still be allowed to refill it based on the original terms under which it was sold. However the new chip-based system will prevent these older mugs from being used and you will need to discuss the situation with a manager to see if they might be able to work out a temporary solution for you. This would be handled on a case-by-case basis.